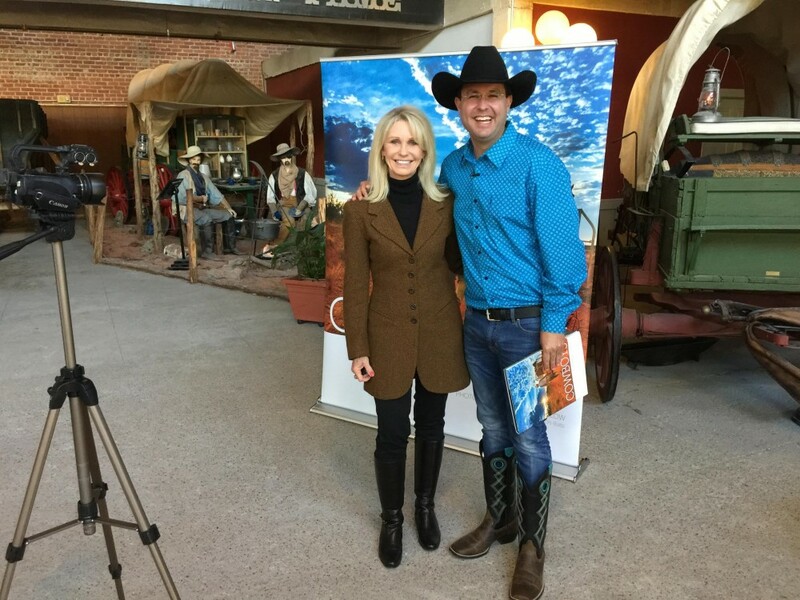 Cowboys of the Waggoner Ranch book took top national honors in the 2016 Great Southwest Book Festival. Besides being named grand prize winner in all book categories, it also was announced as first place winner in the Photography/Art division. Publisher and photographer Jeremy Enlow will be honored at an awards ceremony in Los Angeles in April. 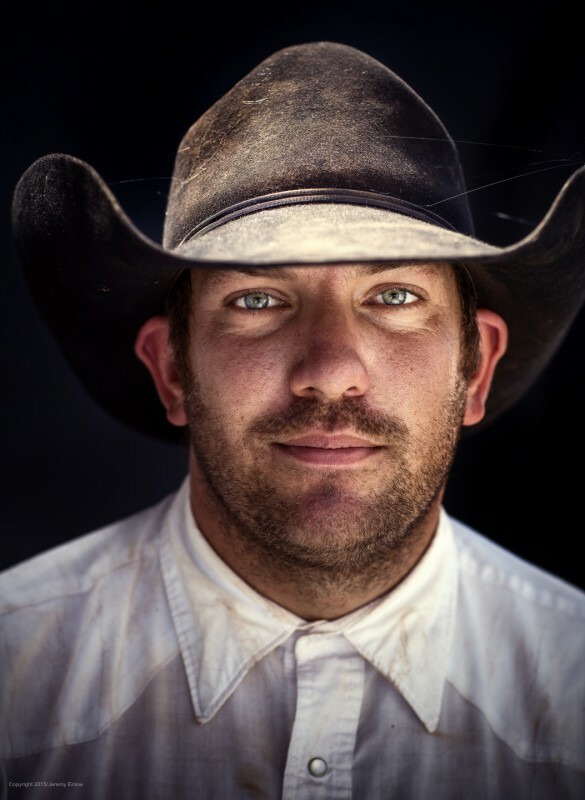 JD Henry, from Cowboys of the Waggoner Ranch by Jeremy Enlow. 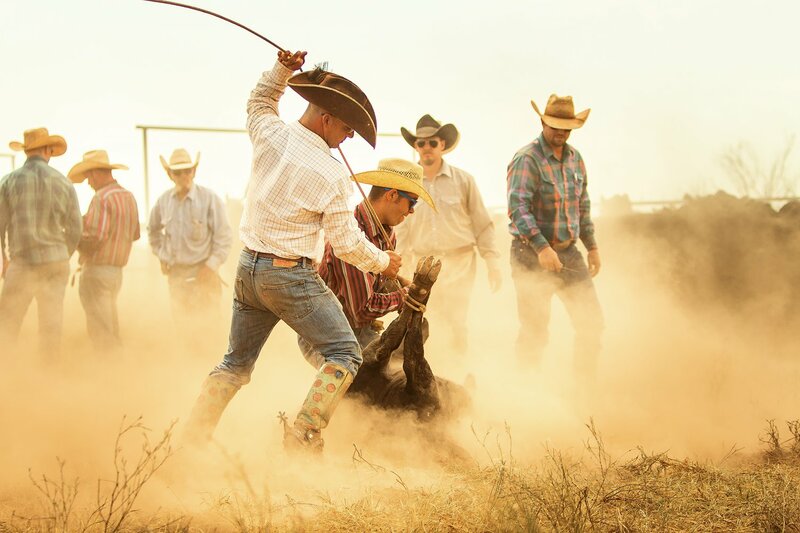 If you’ve read our book, Cowboys of the Waggoner Ranch, or followed us on Facebook, you’ve already gotten a behind the scenes look at the 26 cowboys who work on the Waggoner. Now, we’re taking you behind the scenes of the making of the book! 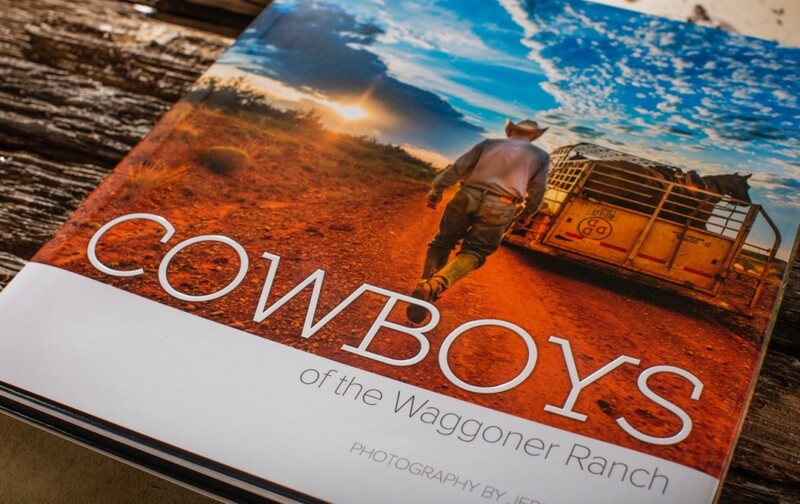 Cowboys of the Waggoner Ranch is photographer Jeremy Enlow’s first book. 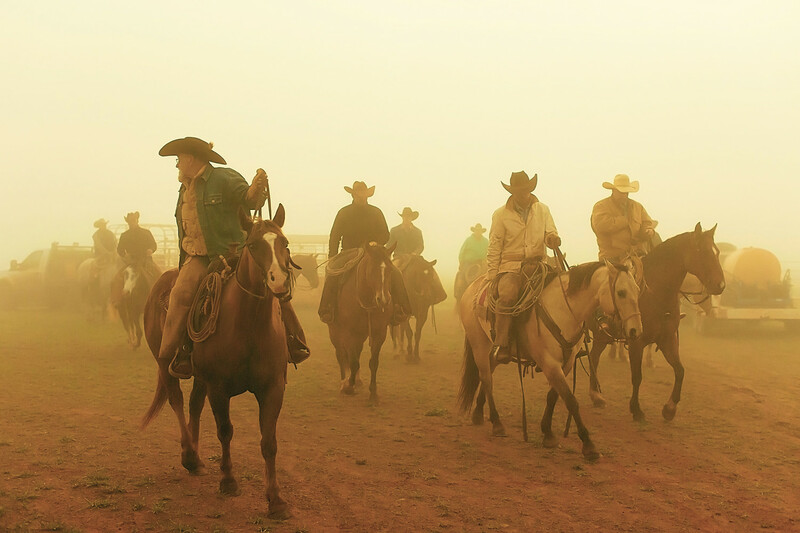 Inspired by the history of the ranch and its uncertain fate while up for sale, he set to work photographing the cowboys who work on the Waggoner. 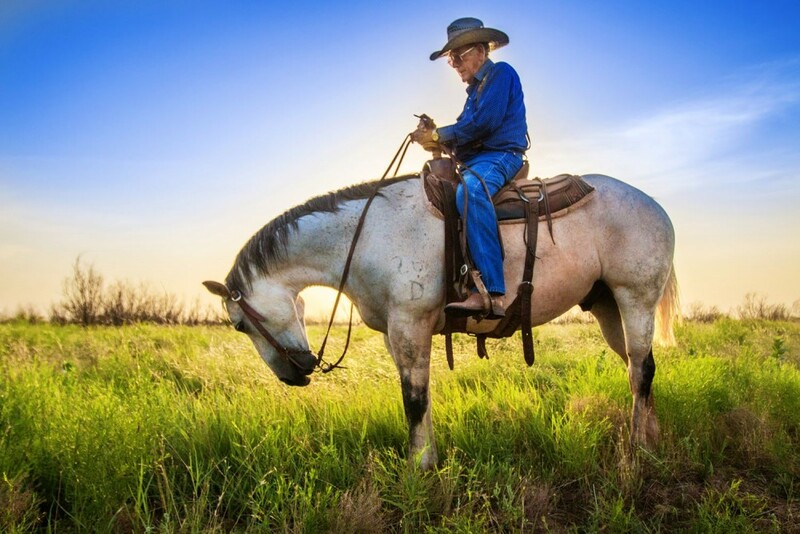 Throughout the process, he captured more than 14,000 images, like the one of Bobby Daniel (below), Waggoner cowboy since 1965. Bobby Daniel, Waggoner Ranch cowboy since 1965, from Cowboys of the Waggoner Ranch. Enlow moved fast, photographing and producing the book in only 6 months. Its success was equally swift, with the first run selling out in only 10 days. From the beginning, this book has been a hands-on, family affair with everyone pitching in. 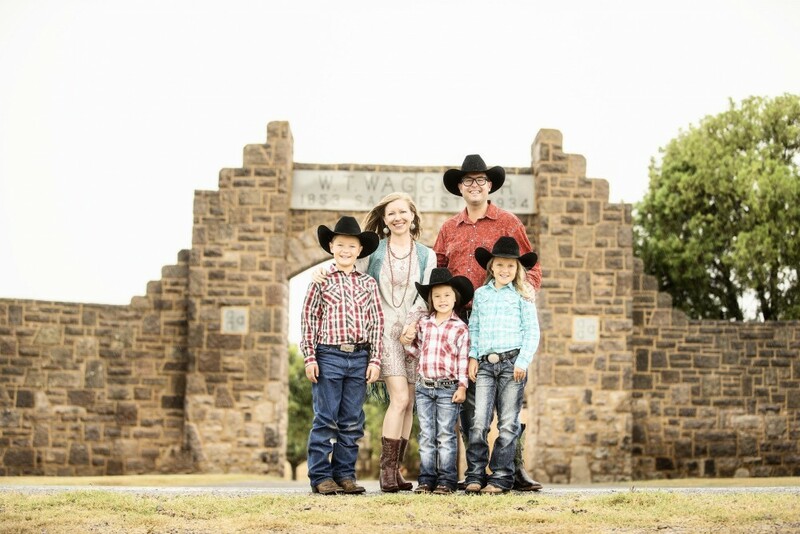 The Enlow family, photographed in front of the Waggoner Ranch. Over the next few months, we’ll be taking you behind the scenes to show you the making of the book and the people who have brought it to life. Be sure to follow us on Facebook and Twitter so that you never miss a story! #LittleTexans Love Cowboys of the Waggoner Ranch! We love seeing #LittleTexans reading Cowboys of the Waggoner Ranch. Young and old, people come together over a good cowboy story. Mr. Ducote sure has an attentive audience! 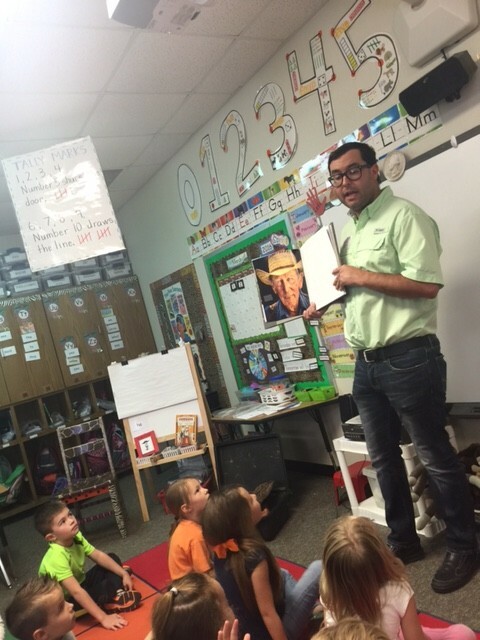 Photographer Jeremy Enlow attended Cowboy Day at an Aledo elementary school. 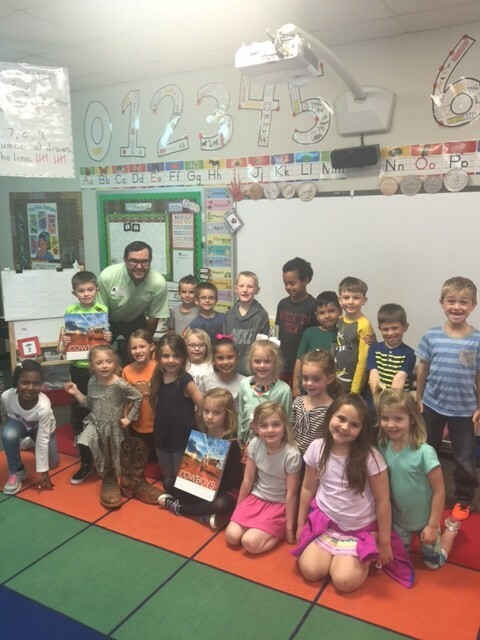 This kindergarten class said their favorite part of the book is the cowboy portraits. 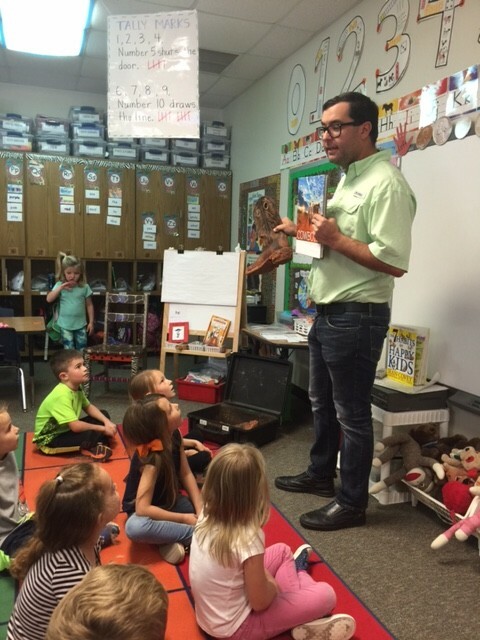 Jeremy brought his dirt-covered cowboy boots to the class. We think they were a hit! We love our #LittleTexans! As Jimbo Glover said, “They’re our future. They’ll replace us old ones one of these days.” Who knows? Maybe there’s some future cowboys and cowgirls in this crowd. 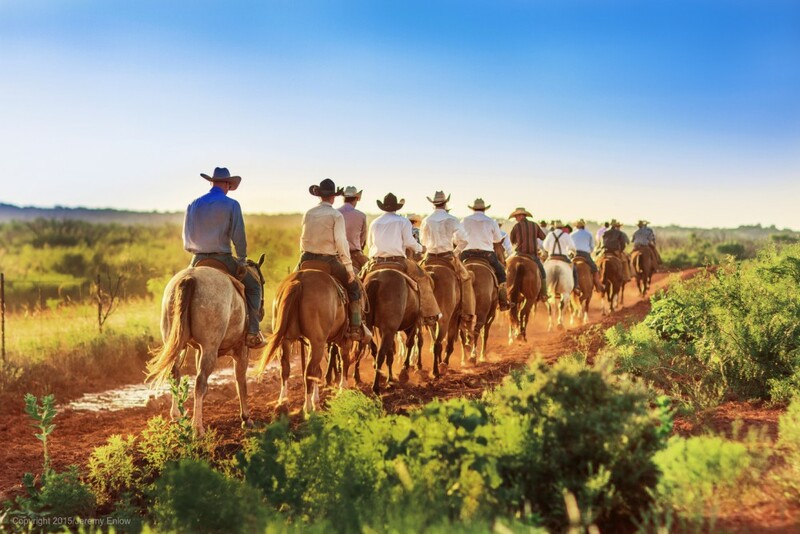 Does your little Texan love Cowboys of the Waggoner Ranch? Leave us a comment or tweet us a pic @WaggonerCowboys! In “Waggoner Unfiltered,” Western Horseman takes readers behind the scenes of Waggoner Ranch and the making of the book. 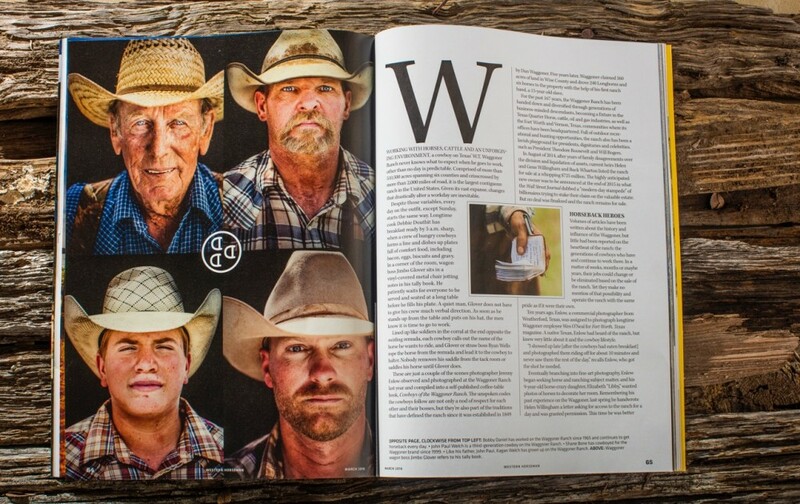 The 9 page story explores some of the iconic images from Cowboys of the Waggoner Ranch and features interviews with photographer Jeremy Enlow and Waggoner cowboys. It’s an unfiltered look at Enlow’s inaugural book like you haven’t seen before. Pick up the March issue of Western Horseman today! 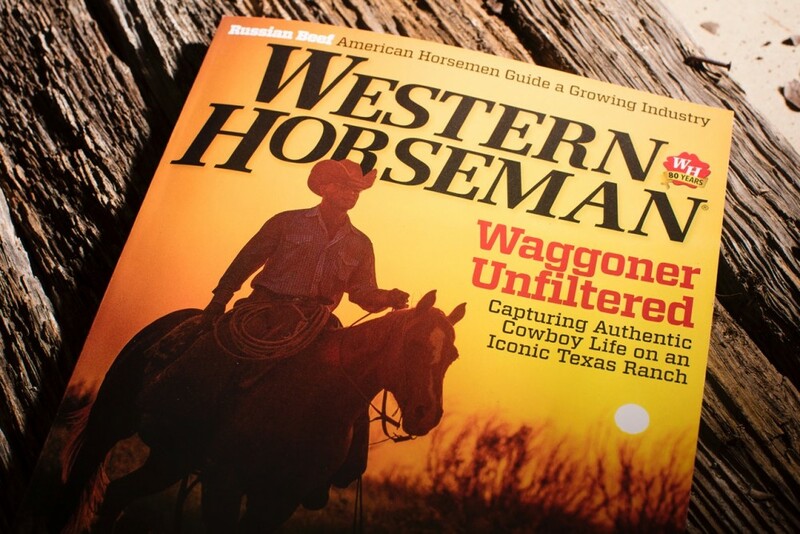 Thank you to all of the Western Horseman readers who have visited our website! 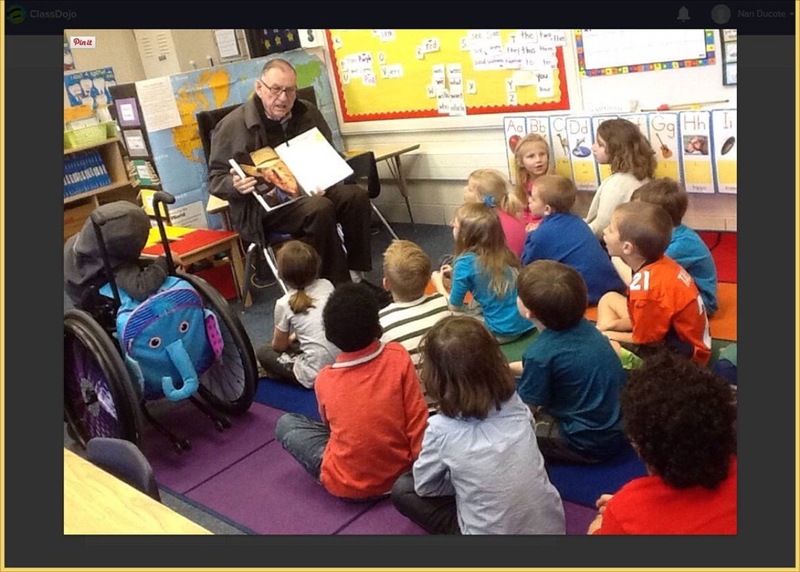 You can follow us on Facebook and Twitter for more Waggoner stories. In commemoration of the sale of the ranch, we are offering free shipping on all U.S. orders. 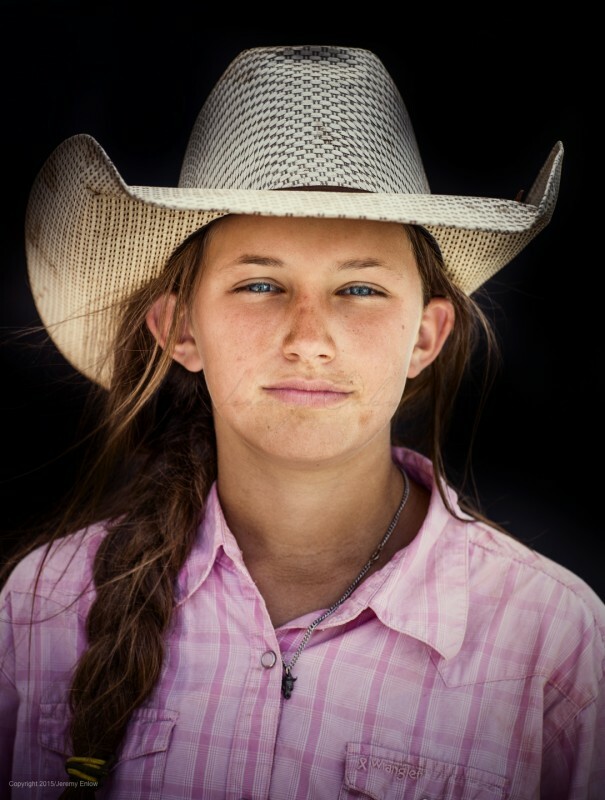 Jeremy Enlow’s portrait of Cassidy “Butch” Chambliss is featured in the Lens Culture Portrait Awards 2016 Competition Gallery. You can view the portraits featured in the gallery and share Butch’s portrait here. Butch, 11, works hard on the Waggoner. The cowboys don’t cut her slack because of her age. On the Waggoner, teaching children how to work on the ranch is a priority. Cassidy Chambliss, eleven, who is called “Butch,” works with the same initiative and drive exhibited by the cowboys. Nobody has to tell her to hurry up or pay attention, the cowboy work ethic having been instilled the previous summer. Not intimidated by the heat or the dust or the cattle, Butch hasn’t decided whether she wants to be a veterinarian or a cowgirl. Eleven-year-old Cassidy Chambliss works with the cowboys during summer vacation. “Everybody calls me Butch,” she says. “I’ve been riding since I was two years old.” She is happy she’ll be riding Romeo. “He likes to go fast!” she grins. Visit the Lens Culture website to share Enlow’s portrait of Butch! 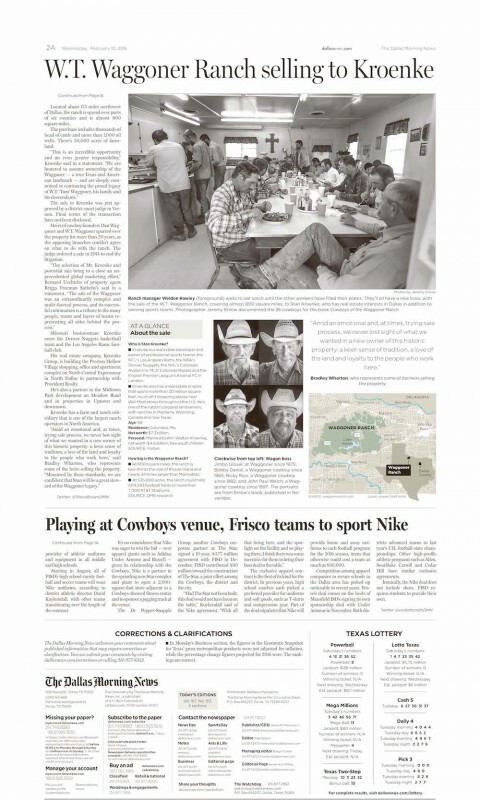 While covering the recent sale of the Waggoner Ranch, the Dallas Morning News featured Jeremy Enlow’s photos from Cowboys of the Waggoner Ranch on the front page. 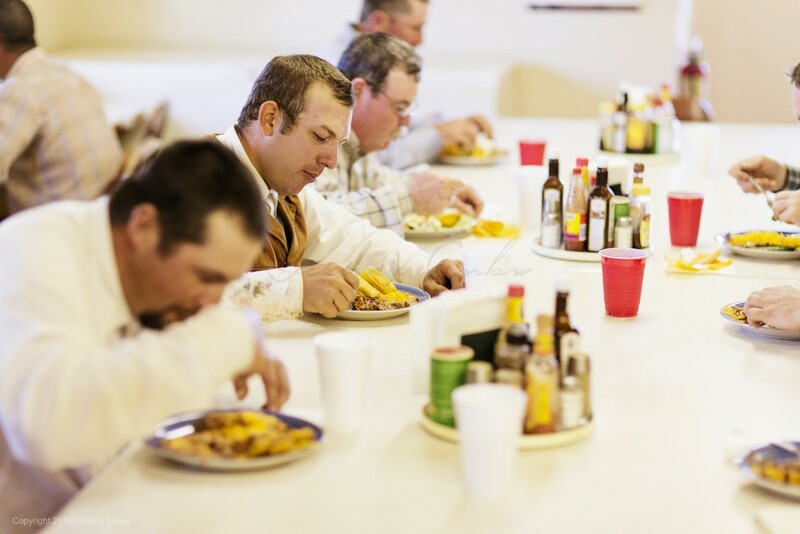 Jeremy Enlow’s work has been featured by the Dallas Morning News several times before, including this two part series (Part 1, Part 2) following his exhibit at PDNB Gallery. John Davidson, former photo editor for the Dallas Morning News, is a long-time mentor to Enlow and was instrumental in the creation of Cowboys of the Waggoner Ranch. 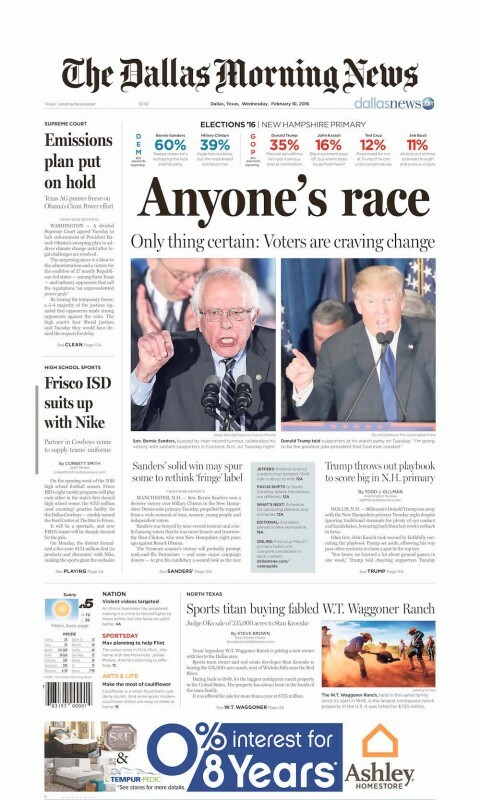 We’re honored to have so many photos featured in this momentous issue of the Dallas Morning News. 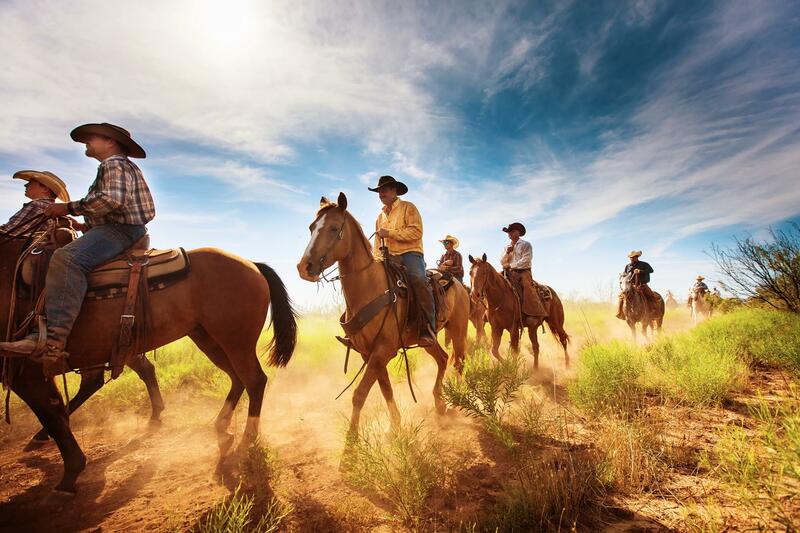 Telling the story of these cowboys to so many people is a great privilege. To commemorate the sale of the ranch, we’re offering free shipping on all U.S. orders for a limited time. UPDATE 2/21/16: Jeremy’s work is on the front page again! 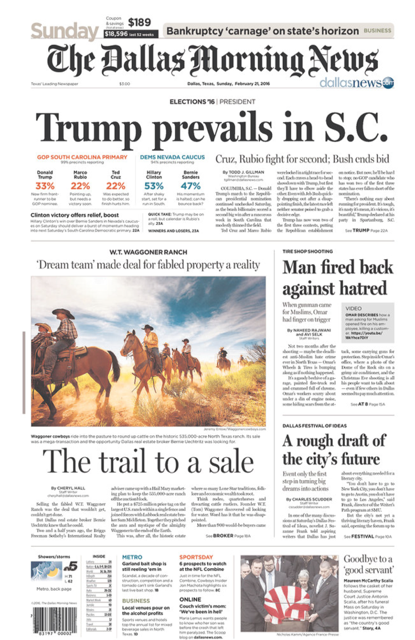 The Dallas Morning News published one of the most interesting articles on the sale of the Waggoner we’ve seen, and a Cowboys of the Waggoner Ranch photo was included in the story! 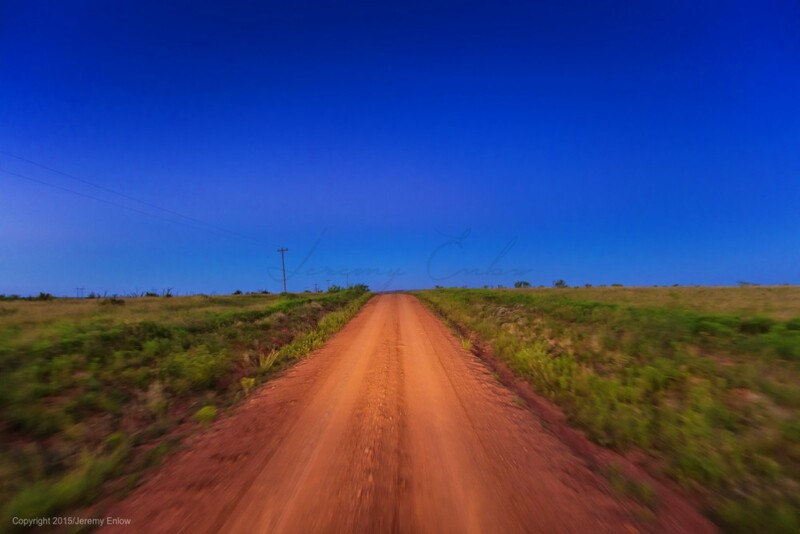 So what’s Kroenke going to do with Waggoner Ranch? Good news in Texas, y’all. It’s done: NFL owner Stan Kroenke closed on the famed Waggoner Ranch this morning. You can read the rest of the Dallas Business Journal’s coverage of the sale here. To commemorate the sale of the ranch, we are offering FREE shipping on all U.S. orders. 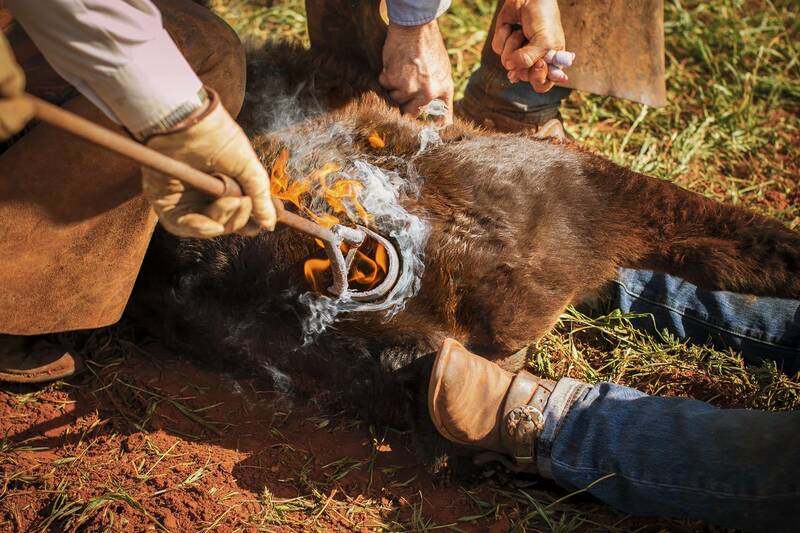 Several media outlets, including the Times Record News and Bloomberg Business, are reporting that the Waggoner Ranch was sold in a Vernon courtroom to the Los Angeles Rams/Denver Nuggets owner. 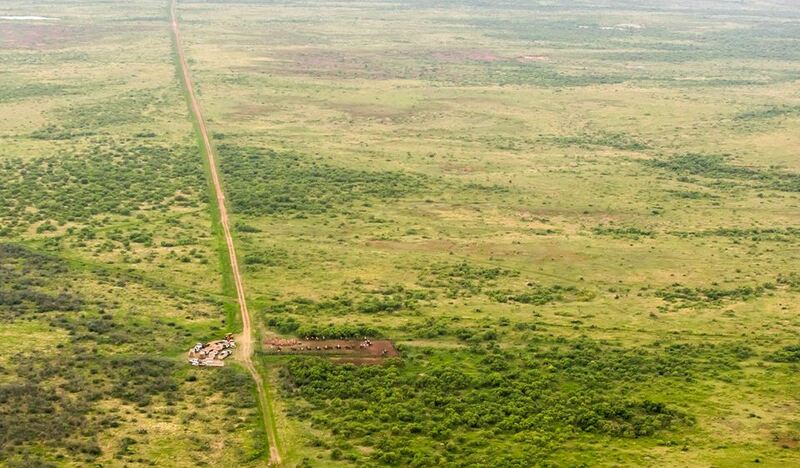 Not including the Waggoner, reported owner Stan Kroenke owns 848,631 acres of working ranches in the US. Until today, the Waggoner Ranch has been under the same family ownership since 1849. Texas was founded in 1845. 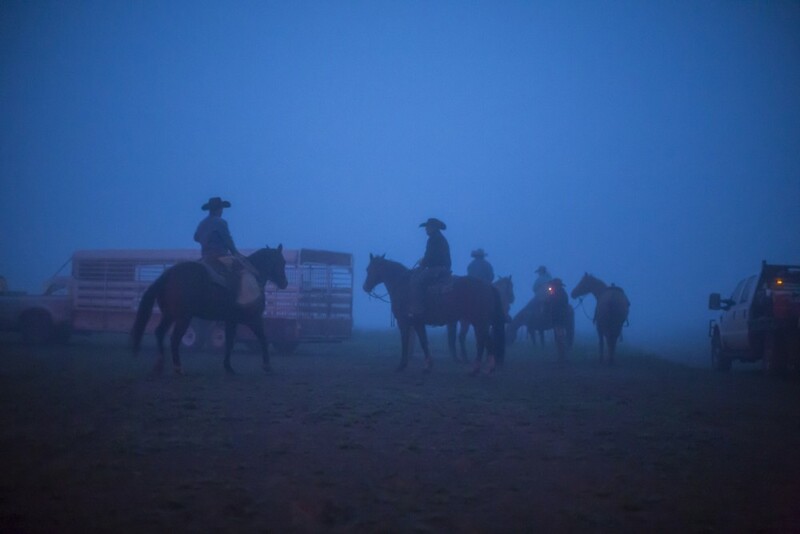 In 2015, photographer Jeremy Enlow was given exclusive access to the to the cowboys behind the prestigious reversed triple D brand of the Waggoner Ranch, the largest ranch in the United States under one fence. He shot thousands of images, culminating in the publication of his first book, Cowboys of the Waggoner Ranch. The book is produced here in Texas. 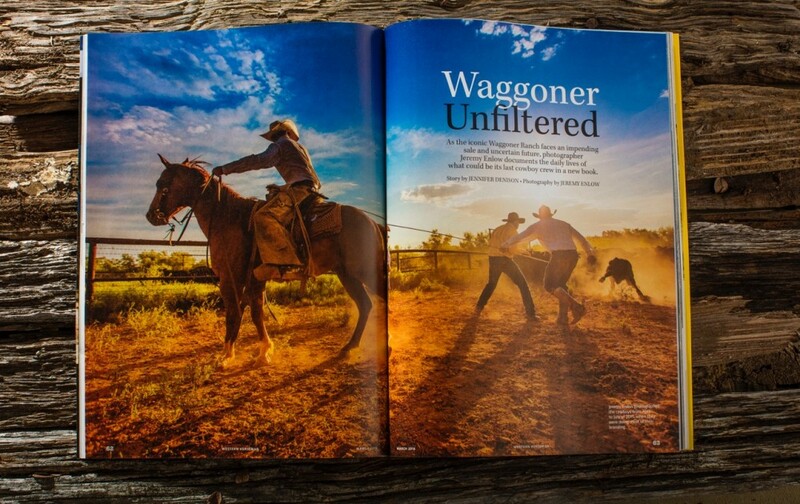 Cowboys of the Waggoner Ranch has been hailed as one of the best coffee table books of the year. 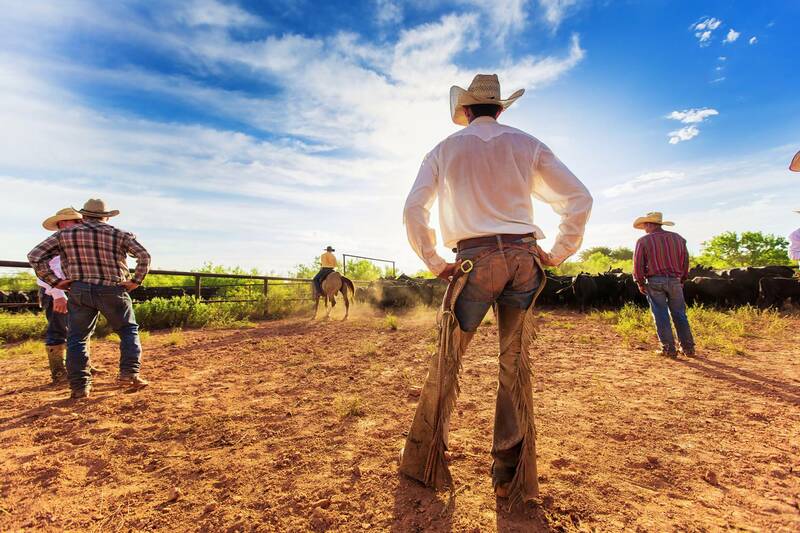 Enlow is passionate about documenting the lives of these cowboys, whose way of life and working has not changed much throughout the ranch’s history. As the ranch changes hands today, we are grateful for all of the photographs, stories, and lives we have had the opportunity to document. Pam Minick is the recipient of the 2016 Western Horseman Award. Photographer Jeremy Enlow recently had the pleasure of talking to Pam about Cowboys of the Waggoner Ranch. We’d like to congratulate her on winning this prestigious award. Talk about Throwback Thursday! 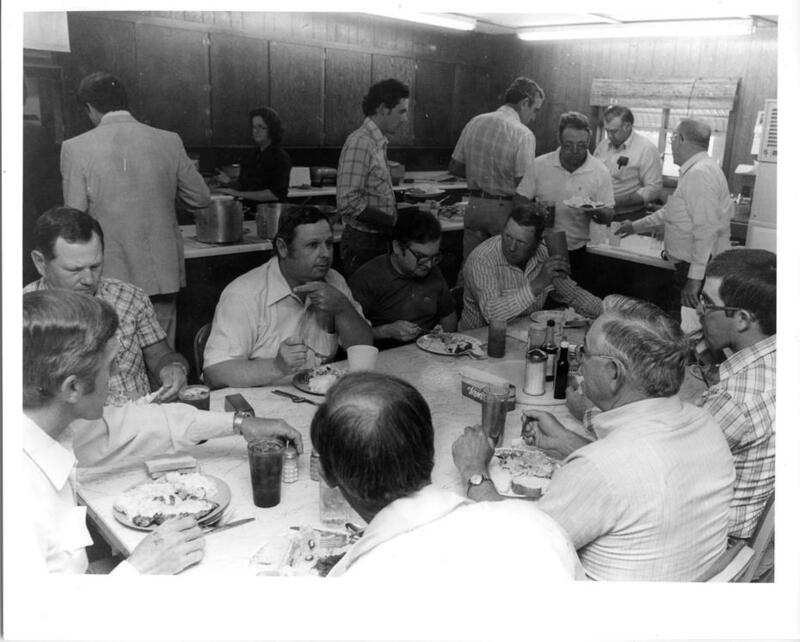 We recently uncovered a great photo of the Waggoner Ranch cook shack taken in 1983. It’s remarkable to see how little has changed between then and now. Do you have any old photos of Waggoner Ranch? We’d love to see them! You can tweet us @WaggonerCowboys or find us on Facebook. Photo credit for the 1983 photo: The Portal to Texas History.